If you’ve ever been responsible for Thanksgiving dinner, especially the turkey, you know how stressful Thanksgiving can be. Add to that hosting (in a small apartment), preparing a few other dishes, and figuring out just how to do all that in a country where Thanksgiving isn’t a thing. Oh, and did I mention that most of your guests are international, so this is their first impression of an American Thanksgiving? Well, that was my first experience celebrating Thanksgiving in Germany. To say that I was needed a beer before the turkey came out of the oven would be a definite understatement. “Thanksgiving” in its traditional US context does not exist in Germany, it’s a uniquely North American tradition. An old German festival called Erntedankfest (literally harvest festival) is certainly related, but it’s more of a religious festival, and definitely not a public holiday. Because it’s not a holiday, celebrating on Thursday is out of the question, and even worse is that many Thanksgiving staples, from the turkey to cranberries and marshmallows, are rather uncommon in German supermarkets. Both of these facts make celebrating a traditional Thanksgiving in Germany a bit difficult to manage. This year (2016) was my first attempt at not only hosting Thanksgiving but also roasting a turkey, and doing so here in Germany. After a somewhat stressful couple of days beforehand, the evening was definitely a success. 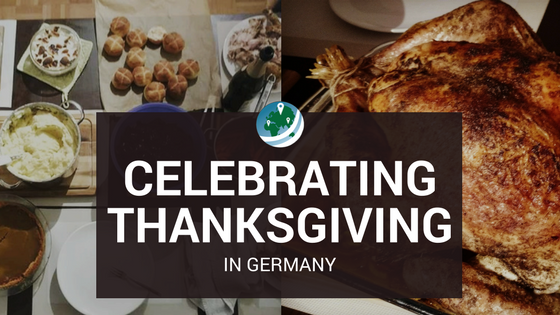 In this post, I’ll explain some of the bumps in the road to putting on a traditional Thanksgiving in Germany. 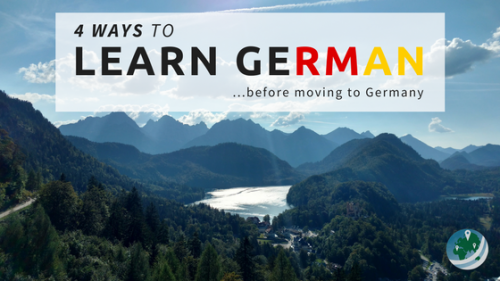 Even if you’re not in Germany, some of the tips and recipes I share in this post will definitely still be very useful. 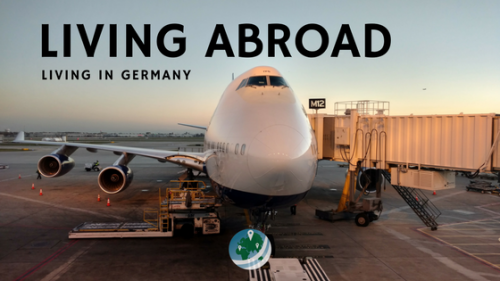 Hopefully, everyone will find reading about this particular challenge of living abroad as interesting and helpful to them as it is those actually struggling to get their Turkey Day off the ground. Maybe that’s the wrong expression since turkeys are notably flightless birds, but I digress… to the turkey! My first turkey! Prepped and cooked by only yours truly. It was an absolute hit. Well, the most conspicuous and iconic symbol of the holiday is probably going to be your biggest problem. Turkey, especially whole birds, is going to elusive, expensive, and probably frozen. The turkeys being frozen isn’t really a problem. But, combine that with being hard to find, and you can easily run out of time for a proper thawing. A good rule of thumb I’ve seen around the internet, is that a turkey will thaw at 3-4 pounds per day in the fridge. That means for a 12-lb. bird, I needed at minimum 72 hours for a full thaw. This obviously depends on the temperature of your fridge, but the rule worked for me. I bought the bird Monday night, and by Thursday evening it was definitely fully thawed and ready for prep. To find your turkey, there are only a few places to look. The large Walmart style stores – apparently called “hypermarkets” – seem to have frozen turkeys of varying sizes. I got mine at V-Markt, but I couldn’t find any at the Galeria in Marienplatz where I expected to. This year, birds up to 6-kg were available where at V-Markt, however, Kaufland apparently had turkeys up to 9 kg. I would bet that real,- would have had them, too. In addition to the massive supermarkets, specialty markets for poultry might have fresh or frozen turkeys around this time of year, too. As I said before, this wasn’t just my first Thanksgiving in Germany, it was my first time hosting and being responsible for the turkey. To make it easy for myself, I used the Foodwishes K.I.S.S. Turkey. Chef John does a great job easing you into the turkey game with the “Your First Turkey” video, embedded below. The recipe didn’t require stuffing the turkey, which turned out great for me. I didn’t have time to make the stuffing until after the turkey was in the oven. Regardless, the turkey came out perfectly juicy, tender, and full of holiday flavors. Thanks again to Chef John! I have to point out a huge, major, and super-important difference between that recipe and what I did in reality. Cooking time. For whatever reason, my 12-lb. bird took just 2 hours at 325°F to reach an internal temperature of 175°F in the thigh/breast. The projected time, at 15 minutes per pound, was 3 hours. So, if you’re roasting something big in a foreign land, don’t trust your American experiences of cooking time. In general, ovens here in Germany are smaller than your typical range oven in the States. Both our current oven and the one in our previous apartment cooked things faster than the expected time on American recipes. Just keep an eye on it, and check the temperature early – earlier than you think. 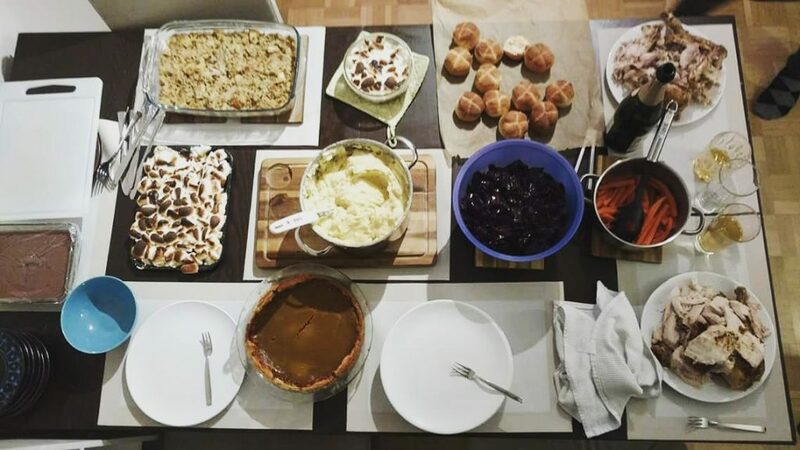 Our spread at this year’s Thanksgiving: turkey, glazed carrots, pumpkin pie, mashed potatoes, sweet potato casserole, rolls, stuffing, and red cabbage. Only the gravy and cranberry sauce are missing from the picture. The other dishes I made for my first Thanksgiving in Germany weren’t nearly as difficult as the turkey was. I was responsible for the stuffing, gravy, and also the cranberry sauce. Out of these three dishes, the only challenging part was finding fresh or even frozen cranberries for the sauce. Luckily, I was able to find 200-gram packages of fresh cranberries at V-Markt for about 2 Euros. God bless V-Markt. The base of the recipes for the stuffing, the gravy, and the cranberry sauce each came from this great video from Andrew Rea below. 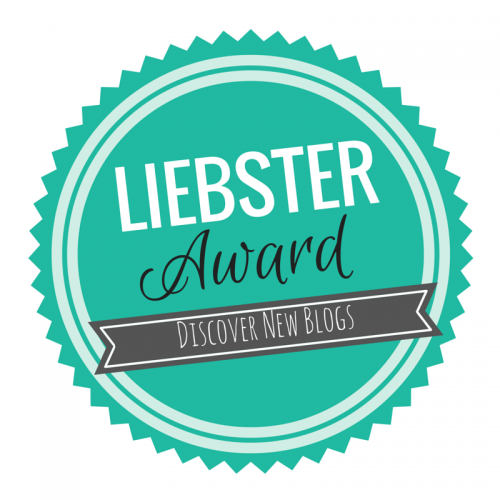 Not only are the recipes great, but the videos are very well done and quite humorous. Add another great YouTube cooking channel to my subscriptions. My only complaint is that I couldn’t find a written out recipe for any of the dishes made in that video. This, along with the general fast pace of the video, made it pretty difficult to follow along and I had to write out some steps and ingredients to make it easier. I followed each recipe for methods but added different levels of ingredients or spices to my taste. Most importantly, I added some of the juices from the turkey’s roasting pan to the gravy, which drastically improved the gravy. Afterall, not adding the pan juices to your sauce is one of the mortal sins of cooking. 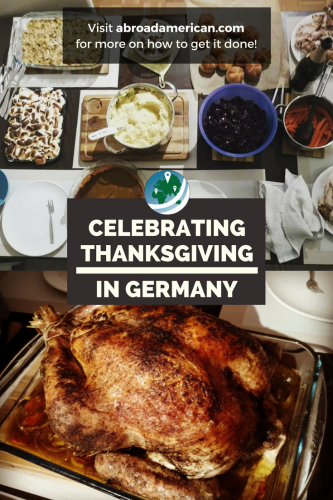 Finally, I’d like to end this post with a little bit about what celebrating Thanksgiving in Germany is like. Other people around the internet have commented on the lack of “holiday spirit” of Thanksgiving in Germany. Well, since the holiday doesn’t exist here, both in spirit and in days off of work, this is kind of obvious. People have also mentioned that because you’ll likely be far away from your family, that side of Thanksgiving in missing. While I agree with that to an extent, I would argue that family isn’t a requirement for Thanksgiving. At least it isn’t for me, probably because I’m generally not one to get homesick. It also helps that this year, I had some of my best friends over and celebrated the holiday in traditional fashion. Only 3 out of the 10 people here were American, we also had two Canadians, and one Colombian girl who went to college in the States. So, four of the guests at our Thanksgiving were celebrating their first! It felt good to spread the joy and fun that Thanksgiving can be, without the frustrating family arguments. The only issue that came up at our Thanksgiving was probably me being too frustrated with too many people in my kitchen at the same time. My bad. Also, someone decided to buy vegan and lactose-free whipped cream for the pumpkin pie. That was nearly grounds for excommunication from the dinner. Otherwise, the holiday was a great success. 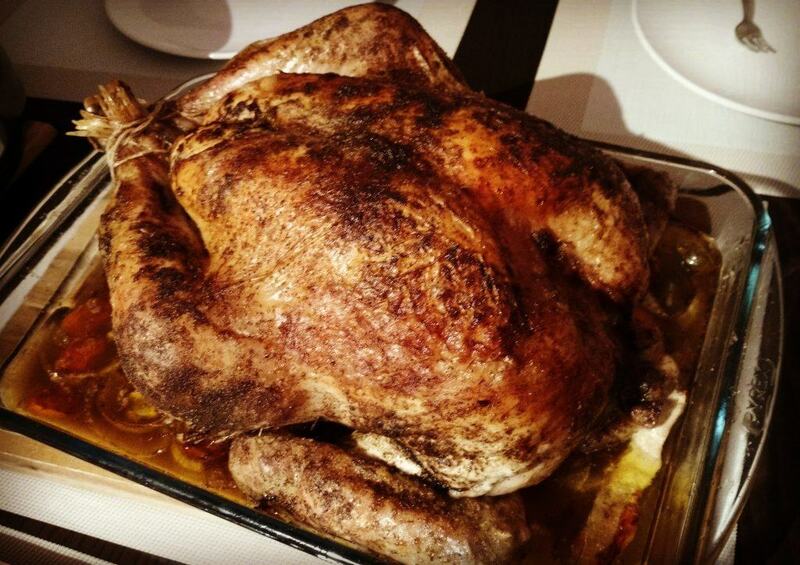 My first turkey, my first traditional Thanksgiving outside the States, everything. It went as smooth as gravy. To those also living outside the States, have you celebrated Thanksgiving in its traditional form? 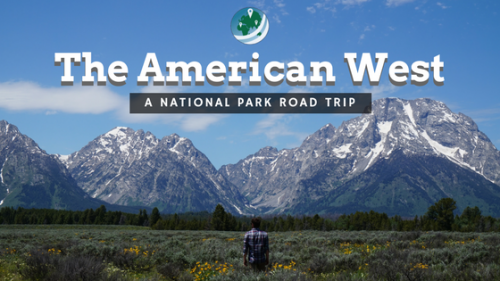 What did you find difficult about cooking or celebrating the holiday away from home?